US diplomats say Iranian insistence on formal recognition of its 'right' to enrich uranium was the major obstacle. US Secretary of State John Kerry told the BBC that none of the differences between world powers and Iran over its nuclear program are big enough to prevent agreement. He said they came "extremely close" to a deal at the weekend in Geneva, but added that the rest of the world had to be certain that Iran was not pursuing a nuclear weapons program. Three days of negotiations ended without a breakthrough, but diplomats will meet again on 20 November. 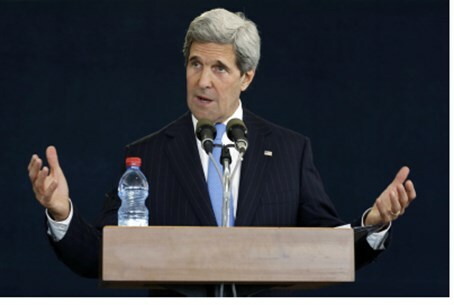 "We were very very close actually, extremely close," Kerry told the BBC. He added, however, that it would "take time to work through differences" between the US and Iran. "We haven't been speaking for 35 years," he explained. "We just talked more in 30 hours than we have in those prior 30 years." While some reports said the latest talks failed because France had wanted to place tight restrictions on Iran's heavy-water plant being built in Arak, the BBC says “US diplomats” are saying that the Iranian government's insistence on formal recognition of its "right" to enrich uranium had been the major obstacle. "They have to see that there is a standard by which they might be able to do something – provided they meet certain standards in order to do it," he said, adding that Iran had backed out of a deal on the last day of talks. "We had a unity on Saturday in a proposal put in front of the Iranians... but they felt they had to go back." Iran has denied this version of what happened. Iranian Foreign Minister Mohammad Javad Zarif responded to earlier statements in the same vein by Kerry, writing on his Twitter account that it was the United States – not Iran – that backed out of the deal. "Mr. Secretary, was it Iran that gutted over half of U.S. draft Thursday night? and publicly commented against it Friday morning?" Zarif tweeted.